You may have seen the "NoDAPL" hashtag on your news feed over the last several months. If you don't know what it refers to, it represents the Dakota Access Pipeline protests across the Standing Rock Sioux Reservation. 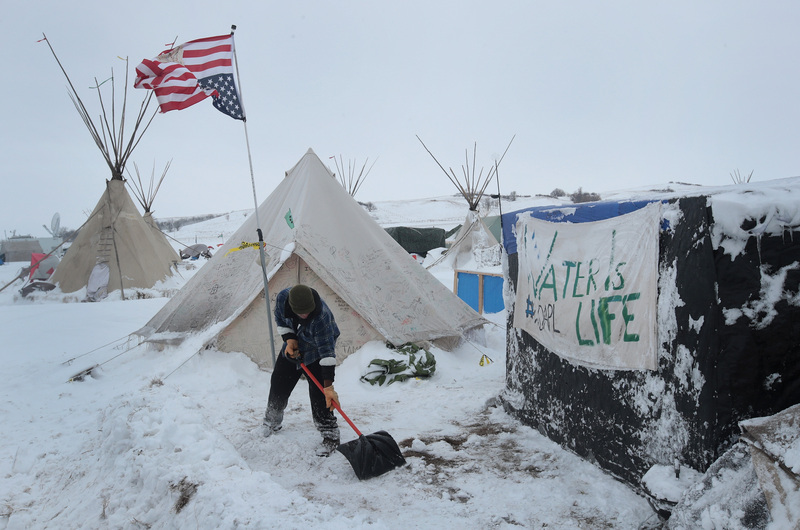 People began protesting five months ago, and continue to protest even as snow has fallen on their camp. Here's a rundown of what you need to know to have an intelligent conversation about this issue. The thousands of protesters are against DAPL because it would potentially destroy the region's land and water supply. The completed project would transport 570,000 barrels of oil each day from the North Dakota Bakken oil fields to South Dakota and Montana across Iowa and into Illinois. Led by the Standing Rock Sioux, Native American tribes and allies are fighting the pipeline because it would desecrate ancestral burial grounds of deceased Native American people and threaten the water supply since it would be built under the Missouri River — and even just a small oil spill could endanger the water supply. Even those at the original site of pipeline construction knew it would endanger the water supply. The initial route of the pipeline — which crossed the Missouri River North of Bismarck — was rejected since the U.S. Army Corps of Engineers felt it posed a danger to municipal water supply wells. The area was determined to be a "high consequence area" in the event of an oil spill per The Bismarck Tribune, even though the consequences of an oil spill at Standing Rock could be just as catastrophic. Protesters have faced water cannons, pepper spray, and concussion cannons. Since there are now sub-freezing temperatures at Standing Rock, organizers have said the use of water cannons has sent 17 people to the hospital, where some were treated for hypothermia. Police defended using a hose on top of an armored vehicle to spray over 400 people on a bridge, while organizers said the bridge was a crucial passage for supplies. Even though these temperatures continue to drop and the Army Corp of Engineers have told protesters to vacate the area by Dec. 5, protesters show no signs of leaving. In fact, more people are coming in: 2,000 U.S. veterans are heading to Standing Rock this weekend to stand with and defend protesters as needed. You can also show your solidarity with Standing Rock by donating to camp or any of these other actions. For more information, visit the Standing Rock website.